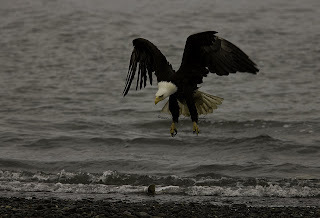 We had such luck in Anchor Point earlier this week that we decided to return there this morning. The last time we were there the tide was out allowing us to walk along the beach for several yards before nearing the surf line; this morning the tide was in covering much of the beach. 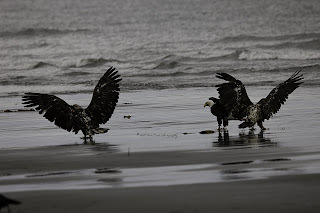 We also noticed a difference in the amount of eagles in the area as there were less today with the tide up. 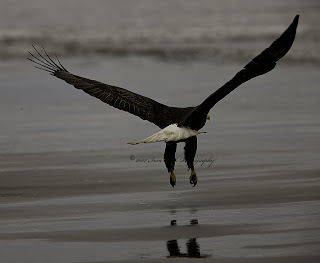 Even though there were fewer eagles than the other day we nevertheless were able to capture quite a few good images. We only used one camera today that being the Canon 1Ds III along with the 400 DO lens; we also decided to shoot slightly different using the different extenders or no extender at all; the focal length for the images range from 800, 560 and 400mm. 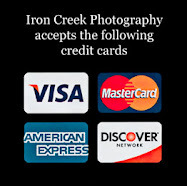 We started out with an ISO of 200 and by the end of the shoot had moved to 250. 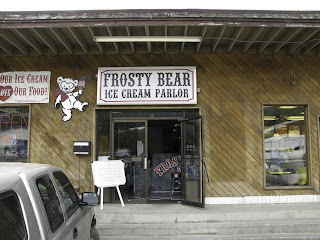 Returned to Homer feeling hungry so we decided to stop at Frosty Bear on Pioneer Ave where we met the new owner Aaron. 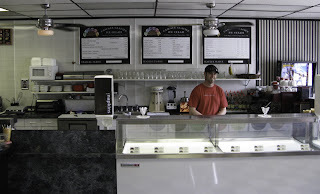 Aaron opened Frosty Bear about a month ago and serves great hamburgers and ice cream among other goodies. 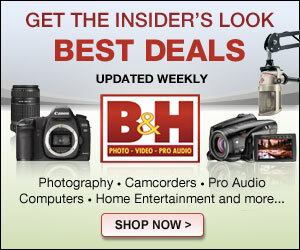 If you want something simple, fast, and, good in a 50’s atmosphere stop by.